Terrorists, racists, and communists— you know them as The Professors. We all know that left -wing radicals from the 1960s have hung around academia and hired people like themselves. But if you thought they were all harmless, antiquated hippies, you’d be wrong. Today’s radical academics aren’t the exception—they’re legion. And far from being harmless, they spew violent anti-Americanism, preach anti-Semitism, and cheer on the killing of American soldiers and civilians—all the while collecting tax dollars and tuition fees to indoctrinate our children. Remember Ward Churchill, the Univer­sity of Colorado professor who compared the victims of the September 11 terrorist attacks to Nazis who deserved what they got? You thought he was bad? In this shock­ing new book, New York Times bestselling author David Horowitz has news for you: American universities are full of radical aca­demics like Ward Churchill—and worse. Say they want to kill white people. Promote the views of the Iranian mullahs. Lament the demise of the Soviet Union. Advocate the killing of ordinary Americans. 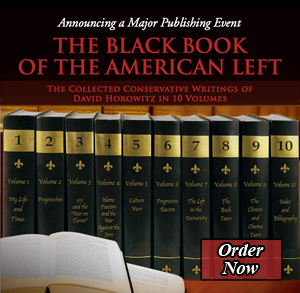 David Horowitz’s riveting expose is essential reading for parents, students, col­lege alums, taxpayers, and patriotic Amer­icans who don’t think college students should be indoctrinated by sympathizers of Joseph Stalin and Osama bin Laden. The Professors is truly frightening—and an intellectual call to arms from a coura­geous author who knows the radicals all too well. David Horowitz speaks on his book, The Professors: The 101 Most Dangerous Academics in America, on March 7, 2006 at Duke University.